"The novelty and magnitude of Europe's predicament make it difficult to understand, tempting to overlook, and nearly impossible to predict. 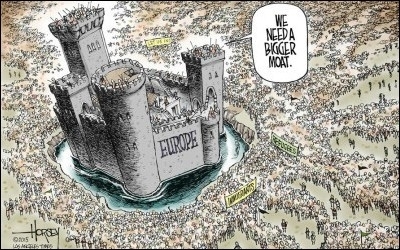 Europe marches us all into terra incognita." That's how I closed an article ten years ago on the topic of Islam's future in Europe. Now, thanks to elections in France and Austria, an answer is emerging; Europeans appear not ready to "go gentle into that good night" but will "rage, rage against the dying of the light." True, the elites, as symbolized by Germany's Chancellor Angela Merkel, remain in deep denial about the issues of immigration, Islamism, and identity. What I call the 6 Ps (politicians, press, police, prosecutors, professors and priests) refuse to acknowledge the fundamental societal changes and enormous tensions their policies are creating. But – and this is the news to report – the masses are starting to make their views heard not just in futile protest but dramatically to change their countries' direction. The French center-right political party, the Republicans, just held its first-ever U.S.-style primary for the position of president of the country. 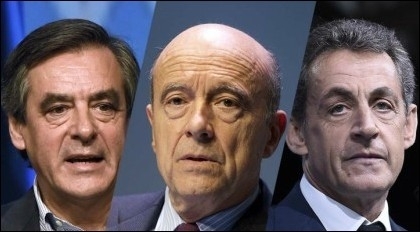 Left to right: François Fillon, Alain Juppé, and Nicolas Sarkozy. In the first of two rounds, seven candidates, including a former president (Nicholas Sarkozy) and two former prime ministers (Alain Juppé and François Fillon), vied to place in the top two slots. For months, Juppé and Sarkozy ran one-two in the polls, with Fillon a distant third. Fillon was so invisible that, for example, a commentary on the French primaries by the excellent Christopher Caldwell ignored him completely. Fillon went on to crush Juppé in the second round, 66-34 percent. Fillon will likely win the first round of the general election and then win the run-off against either the Socialist Party candidate or Marine Le Pen of the National Front. He will have offered a way forward between the silly notion of a "happy identity" (really!) forwarded by Juppé and the insurgency of le Pen, which seeks "temporarily" to nationalize the banks. Juppé and Sarkozy led for months, with Fillon a distant third - until the last few days. Assuming Fillon stays true to his platform, his becoming president has epochal importance for Europe. For the first time, a centrist politician espouses a traditionally patriotic outlook, standing up for indigenous European culture and mores while opposing further large-scale immigration and accommodation to Islamism. This greatly damages the insurgent National Front, an inexperienced party replete with eccentric and often left-wing views. Fillon has broken the Europe-wide taboo against a legacy party stealing the thunder of an insurgent party. If he rides this tactic to victory, he will chart a course for politicians of the center-right from Greece to Norway; already, Merkel has followed his lead by with a dramatic course change, calling for the burqa "to be forbidden." Fillon has broken the Europe-wide taboo against a legacy party stealing the thunder of an insurgent party. The timing of these events is not fortuitous but follows on two developments: repeated major acts of jihadi violence in France and Merkel's 2015 decision to allow in uncounted numbers of unvetted migrants. Merkel's decision, which will likely be seen as a turning point in European history, also helped fuel the spectacular rise of Norbert Hofer of the Freedom Party of Austria (FPÖ) nearly to the presidency of that country, winning 49.7 percent of the vote in May and then 46.2 percent in December, both times running against the Green Party's former leader. Granted, Austria has minor importance and its presidency is largely ceremonial, but the fact that an insurgent party, the FPÖ, two times almost reached the 50 percent mark shatters the consensus view that insurgent parties cannot gather more than one-third of the vote. 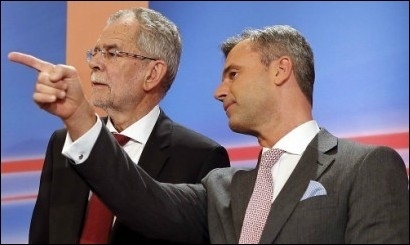 Alexander Van der Bellen (left) beat Norbert Hofer (right) twice in 2016 to win Austria's presidency. They can. Hofer's near-victory has immense implications, suggesting that if legacy parties do not steal the insurgents' thunder in time, those insurgents will eventually reach power on their own. Together, then, the French and Austrian elections suggest Europeans have two alternate paths to reject multi-culturalism, Islamism, and unceasing immigration: either by transforming legacy parties or supporting insurgent parties. Whether they will do so in turn depends mainly on two key developments: the willingness of legacy center-right parties to adopt insurgent party ideas; and the frequency and death toll of jihadi attacks. The terra is becoming more cognita.